May 29, 2017 (LBO) – Sri Lanka’s rescue efforts continued Monday after floods and mudslides affected more than 471,000 people, with further rain forecast for the western slopes of the central hills. The death toll rose to 164 people, with a 104 persons reported missing, and 88 people reported injured, the Disaster Management Centre said. The death toll may equal the floods in 2003 which claimed 250 lives. 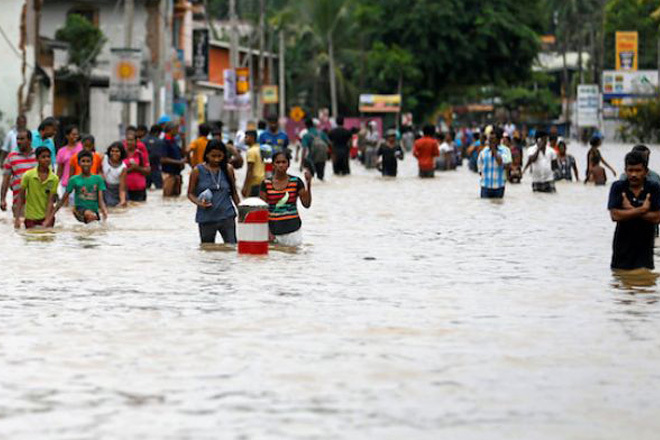 The worst affected districts were Matara, Kalutara, Galle, Rathnapura, Gampaha, Colombo and Hambantota, with 75,000 people brought to safe locations. The Department of Meteorology said in a statement issued at 5.30 am on Monday that the depression in the East central Bay of Bengal has intensified in to a Cyclonic storm ‘MORA,’ although it is moving away from the island. Showers or thundershowers will occur at several places in Northern and North-central provinces and in the Trincomalee districts, the department said in its weather forecast. The public can call hot line 117, 011-267002, or 011-2136222 to inform emergencies at the Disaster Management Centre.